An intuitive user interface, extensive compatibility with products and advanced tracking features make the Wahoo Tickr X the best heart rate monitor. Monitoring your heart rate during workouts is a valuable fitness tool, whether your goal is losing weight or running a faster mile. Knowing your heart rate ensures you are working hard enough and resting appropriately to get the most out of your workouts without overtraining. In our search for the best heart rate monitor, we looked for models that consistently delivered accurate readings. That meant we limited our field to chest strap monitors, the type widely acknowledged to be the most accurate. Our contenders had to be waterproof, so you could wear them for any type of fitness activity. They had to be compatible with a wide range of mobile apps and devices that you already own and use. And they had to be comfortable to wear. Four highly rated models met our criteria: the Wahoo Tickr X, ($99.99 on Amazon), the Suunto Smart Sensor ($64.16 on Amazon), the Polar H7 (starting at $49.14 on Amazon) and the 4iiii Innovations Viiiiva ($79.99 on Amazon). After weeks of testing, we chose the Wahoo Tickr X as the best heart rate monitor based on its usability, extensive app compatibility, reliable device pairing and advanced motion tracking features. To test reliability, we paired each model with smartphones to test Bluetooth Smart or with sports watches to test ANT+ technology. Then we used them while performing a number of common exercises, including outdoor running and cycling, treadmill running, and indoor workouts and fitness classes. Every unit easily connected to compatible mobile phones, sports watches and gym equipment. The Suunto Smart Sensor suffered multiple instances of lost sensor connectivity with another piece of equipment or its own mobile app called Movescount. In our field of otherwise reliable units, the Suunto Smart Sensor was the only one with unreliable connectivity and data reporting for the duration of a workout. 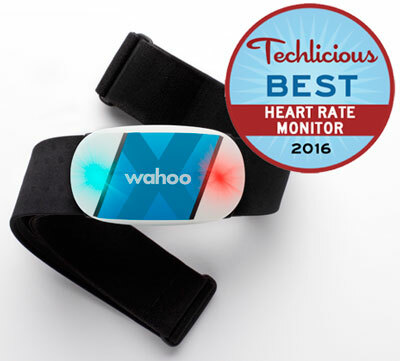 Wahoo’s Tickr X goes beyond basic heart rate monitoring to offer 16 hours of memory for tracking heart rate and workout duration metrics. This lets you complete a workout without needing to carry a smartphone or other device. Start and stop recording your workout without your phone by tapping the sensor. After completing a workout, sync the device to your Wahoo mobile app and receive heart rate data (max and average), workout duration and calories burned. For more detailed information, you'll need to keep a smartphone or smart watch on hand during your workout. The Suunto can also store your data, but you’ll need to start and stop your workout with your smartphone or sports watch. The Tickr X offers vibration alerts and tapping features during a workout. Tap the device to start and stop workouts, mark a completed lap or splits, or skip songs. The Tickr X vibrates at predetermined markers every five minutes, every mile completed, or whatever other marker you choose. Unfortunately, we had a hard time feeling the vibrations during active exercise like sprint intervals. The Tickr X's built-in accelerometer can provide stride rate data, ground contact time and other metrics that would normally come from an additional foot pod. The accelerometer also records overall running smoothness, based on measurements from three different planes of movement: sway, ground strike and bounce. These metrics are synced through the RunFit app, which is only available to iPhone users; if you use an Android smartphone, you won't be able to use this app and data together. The Wahoo Tickr X was the only unit we tested that offered any way to tell if the monitor was actually on. A blue light blinks to signal its connection to a device, and a red light blinks to signal that the heart rate monitoring function is working. With all other units, the only way to verify monitoring and connectivity is to wear the unit, open a mobile app or connect the monitor to a watch and wait for confirmation that it’s synced. If you’re using the monitors device-free, there’s no way to know if it's stopped working halfway through a workout. You'd only find out at the end when it’s unable to sync to another device and you discover that readings for the workout have been lost. In terms of comfort, all the styles tested were easy to put on and adjust. They were all unobtrusive to wearers, and there was no clear discernable difference between wearing any of the units. While the Suunto is the smallest device, all the units we tested are small to begin with, making it impossible to discern any difference in feel or comfort between them once they're on your body. 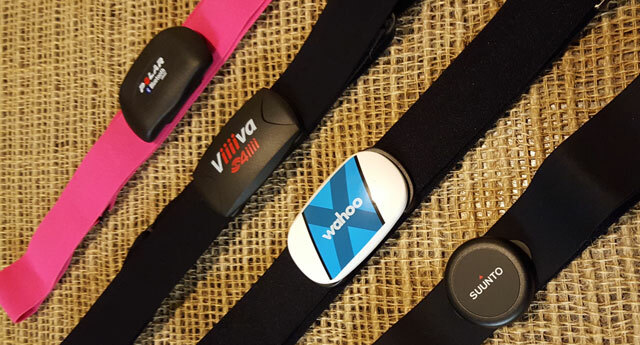 Both the Polar and Suunto snap directly onto the belt, while Viiiva and Wahoo have clips on either side where you close the belt. All were easy to clip on and quickly became virtually unnoticeable against the body. Each of these heart rate monitors leaves marks from being worn so closely against the body, but it's nothing worse than the effect you'd get from wearing compression clothing like bike shorts or a sports bra. Each of the models we tested let you get them wet, but only the Suunto is really designed for swimming with water resistance rating to 100 feet. The others are rated as water-resistant between five and 10 feet. The Wahoo Tickr X comes with up to 12 months of battery life, the Suunto Smart Sensor delivers up to 500 hours of use and the 4iiii Viiiiva and Polar H7 provide up to 200 hours of use. Detach the sensor from the band and dry it after use, because the sweat and moisture in the band may keep the electrodes wet, which could keep the sensor on longer than necessary. All of the heart rate monitors work with third-party apps that support a heart rate monitor like the Pear Personal Coach, the RunKeeper and the Strava. If you’re already using an app you like or want to use a specific app that supports a heart rate monitor, you can connect your monitor to the app and keep using it. There’s no need to use the manufacturer’s app, although some provide additional features and value. Wahoo makes three apps that are compatible with the Tickr X: Wahoo Fitness (for Android and iOS), 7 Minute Workout (for Android and iOS) and RunFit (iOS only). Out of the units we tested, only Wahoo and Polar provided fitness feedback on heart rate zones throughout the workout. The Wahoo Fitness app was much easier to read, breaking down the time spent in each targeted zone and charting the course of your heart rate throughout the workout. The Wahoo and Polar apps also showed calories burned and provided a map of your route at the end — good information to have, but information you can also get from apps that run with the other two devices we tested. Wahoo’s RunFit app takes advantage of the motion sensor in the device to track your running form, report your cadence and provide advanced running information. For instance, it looks at your ground contact time and smoothness across three planes of movement: sway, ground strike and bounce. These are capabilities typically only available to users who purchase and wear a second device like a foot pod. For now, the app is only available for iOS devices. Android users interested in this data need to purchase a foot pod and use it in conjunction with an app like Runkeeper or Strava. In addition, Wahoo offers 7 Minute Workout, a series of exercises performed without any equipment. It’s specifically designed to take advantage of the Wahoo Tickr X’s motion sensor, using it to track and count repetitions out loud for users. One downside to the Wahoo apps is the fact that stats are only saved locally, unless you share them with another app like Nike+, Strava, Apple Health or MapMyFitness. You can turn this feature on to automatically sync in the app. If you’ve only saved your workouts in the app, you’ll lose your data when you move to a new device unless you first sync your data with another app. The Polar H7 works with the Polar Beat app (for Android and iOS). Polar Beat tracks workouts like Wahoo Fitness, providing real-time heart rate, heart rate zone information and a map of our route. A number of upgrades ranging from $2.99 to $3.99 include a fitness test, real-time coaching and a running index. Data received through upgrades syncs to an online portal called the Polar Personal Trainer, where you'll find even more personalized programs and additional analysis. Through Polar Beat, the Polar H7 is also now compatible with the Apple Watch. For the Viiiiva, 4iiii Innovations offers the 4iiii Device Configuration app for Android and the 4iiii app for iOS. Both apps are extremely bare-bones applications. The iOS system is the more advanced of the two, breaking down heart rate into zones; the Android app simply charts the heart rate in general. You’ll definitely want to use a third-party app with this heart rate monitor. The app for Suunto’s Smart Sensor, Movescount (Android and iOS), tracks your heart rate plus speed, distance and calories. There’s route tracking and even a 3D map. Movescount’s main focus is social media. It allows users to create 3D movies of their training and upload workout photos featuring real-time data overlaid on the picture. We didn't find the app easy to use. Pressing “Start Workout” is only the first of two steps required to begin recording, and there were multiple instances where the application closed halfway through a workout when we tried to use the camera function and other in-workout features. In addition to using apps for training, pair your heart rate monitor to sports watches and gym equipment. For the best shot at connectivity, you’ll want a monitor with both Bluetooth and ANT+. Of the monitors in our group, only the Wahoo Tickr X and the 4iiii Viiiiva have Bluetooth and ANT+. The Viiiiva goes one step further and acts as a bridge between Bluetooth Smart and ANT+ technology, translating a device’s ANT+ signal over Bluetooth Smart (BTLE.) By acting as a bridge, the Viiiiva can receive multiple (when paired together) or single signals from ANT+ sensors such as foot pods, power meters, or speed and cadence sensors. Viiiiva can then transmit the information to ANT+ devices like bike computers and sport watches or translate the ANT+ to BTLE and send the signal to smartphones and other Bluetooth devices. The Suunto Smart Sensor and Polar H7 have Bluetooth and no ANT+. The Polar H7 also works with gym equipment bearing the Polar logo through its proprietary system, GymLink. All of the monitors we tested receive high ratings on Amazon. The Wahoo Tickr X receives a 3.9 on Amazon and 4.5 stars on Apple.com. The Wahoo Tickr X ($99.99 on Amazon) offers the most advanced features, can be used without a smartphone and is compatible with a wide range of devices and apps. This makes the Tickr X the most versatile heart rate monitor, letting you work out the way you want without limitations. While it's a little more expensive than the other monitors, the features and performance are well worth the premium. If you don’t need the built-in memory, rep counting or vibration alerts, Wahoo offers the Tickr Run ($79.99 on Amazon), which tracks running form and cadence, or the Tickr ($49.99 on Amazon), which is a basic heart rate monitor. Thank you for the article. Very comprehensive and tons of great info. For the connectivity would you recommend either the bluetooth of ANT+ over the other or does it not really matter? Just seeing if one is better than the other in your opinion. I didn’t find that in the artilce unless I missed it. Our pick, the Wahoo Tickr X has both Bluetooth and ANT+, so there’s no need to choose between the two when selecting a heart rate monitor. In fact, you can use the Tickr X with an ANT+ device, like a sports watch or gym treadmill, and a Bluetooth device, like your smartphone at the same time. Hope this helps. Hi Suzanne, i notice you said the tickr x will only provide heartrate min & max if downloaded after a workout. But i notice that screen shots show a graph of heart rate over time. Can you throw more light on this.? You’ll get the graph if you have the monitor paired to your phone and you’re using the app along with the Tickr X while working out. If you use just the Tickr X without the phone (i.e. tap the Tickr X to start and stop your workout) and download the workout to the app after you get back, you’ll just get min and max heart rate. I am thinking of buying the tickr x to use when cycling. I don’t want to take a smartphone with me. I want to be able to see my heart rate on a watch, but don’t want a fancy watch with lots of functions that I will not use. Is there an option that you would suggest? The Garmin Vivofit 2 Bundle with heart rate monitor ($89 on Amazon) would be a good option. You can set the display on the watch to continuously show heart rate, but you can also check distance, time etc. And, if you want to track your workouts, it will sync with your smartphone. It’s waterproof, so you don’t have to worry about it getting wet. Hope this helps! Thanks for article. I’m trying to find a strap based HRM that would pair to my phone while playing squash. I can leave my phone outside the back glass wall. So the furthest I would be away from the phone would be 30 feet although most of the time I would be less than 18 feet away. Any idea whether BLT has a bigger range and would it work through a glass wall? I’ve got a Garmin HRM fitness tracker but wrist based measurement doesnt seem accurate and trying to avoid buyng a Garmin watch to view the strap based HRM data. I use the Wahoo Tickr while i play squash and it tracks my heart rate. The only issue i have is that the app only lets you record the workout to as “Running, Treadmill. Cycling, Indoor Bike or Spin Class” none of which have much relevance to squash frankly. If someone knows of a device that is more relevant to squash I would be very interested. The Polar Beat app, which works with the Polar H7 and H10 heart rate chest straps, will let you choose squash as a sport to track. I’ve tested both the Polar H10 ($89.95 on Amazon)and H7 ($46.95 on Amazon) and have been happy with their performance. The H7 is a basic model that’s comparable to the Tickr you have. I’ve used all of the Tickr models too and the Polar performance is comparable. One of the main reasons why we choose the TickrX was that you could capture data from a run without having your smartphone with you. The Polar H10 adds this feature, among others. Which one would you recommend? How much of a difference is there?